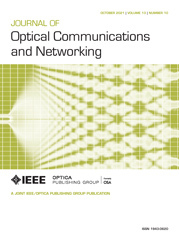 Abstract: Considering middle-term predictions of the need for commercial 10-Tb/s optical interfaces working in 1-P b/s optical transport systems by 2024 and recalling the introduction of the optical bypass when entering the wavelength-abundant era in the early 2000s, we re-evaluate the values of hierarchical optical network architecture in light of the forthcoming massive spatial division multiplexing (SDM) era. We introduce a spatial channel (SCh) network (SCN) architecture, where the SDM layer is explicitly defined as a new networking layer that supports the new multiplexing technology of SDM. In an SCN, optical channels (OChs) accommodated in an express SCh bypass the overlying wavelength cross-connects (WXCs) using spatial cross-connects (SXCs) on the route. As one challenge that SCNs will present, we point out that an excessively large SXC insertion loss reduces the optical reach for spectrally groomed OChs. We show that the optical reach of spectrally groomed OChs can be maintained at almost the same level as that for an OCh transported through a conventional single-layer WDM network thanks to the low-loss features of commercially available spatial switches and foreseeable low-loss SDM multiplexers and demultiplexers. As another challenge, we discuss how to achieve growable, reliable, and cost-effective SXCs. We propose two SXC architectures based on sub-matrix switches and core-selective switches. Simple cost assessment shows that the proposed architectures are more cost-effective than the full-size matrix switch-based architecture with 1 + 1 equipment protection and conventional stacked WXC architecture. Abstract: Flexi-grid technology has emerged as the evolution of fixed-grid DWDM core optical networks, enabling more efficient utilization of spectral resources and leading to higher overall network throughput. However, it suffers from an aggravated form of the spectrum fragmentation problem that affects fixed-grid networks. This work presents a novel path-based metric to better evaluate the fragmentation of spectral resources in flexi-grid optical networks, which considers that not all links of a path may contain enough free frequency slots and the likelihood that an end-to-end spectral void is large enough to house a connection. Furthermore, two families of heuristic routing and spectrum allocation (RSA) algorithms that preventively attempt to minimize the value of an input fragmentation metric are presented. These are used to evaluate the effectiveness of multiple metrics, both introduced in this work and from the existing literature, via simulations. We find that both proposed families can perform better, in terms of blocking probability and achievable network throughput, than the well-known K-shortest paths routing with a first fit spectrum allocation policy, with one of them trading performance for lower complexity, and that the proposed fragmentation metric outperforms the existing ones. Abstract: In this paper we show that the adoption of a simple weighted ordering heuristic strategy to find fixed shortest path routes in a topology can improve load-balancing and, consequently, network performance. We compared our fixed routing strategies against the k-shortest paths (k-SP) fixed-alternate routing strategy for three different mesh topologies considering fixed grid networks (FGNs) and elastic optical networks (EONs). The results show that our simple fixed routing strategies can improve network performance for an optical network system, even compared with the fixed alternate routing and always using the shortest path. Results also show that such easy strategies act mainly in longer routes, increasing their probability of use and balancing the link load distribution. Abstract: Elastic optical networks (EONs) rely on efficient resource planning to meet future communication needs and avoid resource overprovisioning. Estimation of physical-layer impairments (PLIs) in EONs plays an important role in the network planning stage. Traditionally, the transmission reach (TR) and Gaussian noise (GN) models have been broadly employed in the estimation of the PLIs. However, the TR model cannot accurately estimate PLIs, whereas the GN model is incompatible with state of the art linear optimization solvers. In this paper, we propose a physical-layer estimation model based on the GN model, referred to as the conservative linearized Gaussian noise (CLGN) model. To address the routing, spectrum, and regeneration assignment problem accounting for PLIs, we introduce a link-based mixed integer linear programming formulation employing the CLGN, whose heavy computational burden is relieved by a heuristic approach referred to as the sequential iterative optimization algorithm. We show through simulation that network resources such as spectrum and regeneration nodes can be saved utilizing the CLGN model rather than the TR model. Our proposed heuristic algorithm speeds up the optimization process and provides better resource usage compared to state of the art algorithms on benchmark networks. Abstract: Dynamic traffic in optical networks leads to capacity fragmentation, which significantly reduces network performance. Consequently, non-disruptive re-routing has attracted a lot of attention from network providers as it dramatically improves the amount of traffic that can be granted with a good quality of service. The recent development of flexible and software-defined networks is urgently calling for faster real-time reconfiguration algorithms at all network layers, while being highly efficient in terms of optimized reconfiguration of connections. We propose a very efficient non-disruptive bandwidth defragmentation heuristic (called mbb_df_h) with a make-before-break (MBB) strategy at the user layer. In order to assess its accuracy, we also develop a near- optimal two-phase defragmentation process. First, we formulate an exact optimization model for the decomposition scheme in order to compute the best re-routing, i.e., with minimum bandwidth requirements. Second, we investigate whether the resulting re-routing can be reached with a MBB policy; if not, we exhibit the best possible MBB re-routing. We conduct extensive numerical experiments on several data sets. We first run experiments on small to medium data sets so that the solution efficiency of the mbb_df_h heuristic can be compared with the two-phase optimization models. Next, we focus on the real-time scalability of the mbb_df_h heuristic on large realistic data sets. Abstract: Quantum key distribution (QKD) is considered a secure solution for key distribution and applied in optical networks to overcome security issues by providing key services in different lightpaths. In optical networks, lightpaths in fibers can be used for the delivery of QKD due to their good transmission performance. Accordingly, optical networks secured by QKD have been regarded as an important paradigm, and survivability in this paradigm is an issue worthy of study. In this paper, we focus on the protection schemes for key services in optical networks secured by QKD. Specifically, in consistency with two characteristics of key services (i.e., the key-updating process and key-volume adaptive routing), two key-volume adaptive protection schemes (i.e., dedicated protection and shared protection) are proposed for the networks against link failures. In such scenarios, the designed key-protection threshold can alleviate the tight network resources caused by the key-updating process. Simulation work has been conducted to evaluate the performance of the proposed schemes in terms of blocking probability, resource utilization, and proportion of secret-key consumption with different key-protection thresholds and update periods. Numerical results show that the two proposed schemes are effective in providing protection. Furthermore, evaluating the impact of protection on network security verifies a trade-off that exists between how much protection can be provided for key services versus the overall security of the network, given a certain resource budget. Abstract: The time- and wavelength-division-multiplexed (TWDM) passive optical network (PON) is a popular choice for future access technology. However, a comprehensive understanding of its economics is still beyond the reach of the current literature. For example, it is not clearly understood which techno-economic factors make this technology sustainable. Similarly, the role of the government in influencing the users' welfare has also remained opaque. In this paper, we uncover these important issues. Portraying the operator as a profit maximizer, we develop a mathematical model that encapsulates both economic and technical aspects of the network. Within this framework, the profit maximization problem of an operator turns out to be a mixed-integer nonlinear program that, in general, is exponentially complex. Fortunately, using a widely accepted assumption on user demand, we reduce this to a discrete optimization. Moreover, for a large class of demands, a polynomially complex algorithm is developed to solve this problem. For homogeneous linear demands, we analytically characterize the system parameters that ensure the sustainability of the network in the long run. In addition, the influence of different system parameters on the economic outcomes is studied. Our investigation reveals several policy-making insights. For example, it unveils a fundamental trade-off between the number of users and the aggregated welfare. Also, it suggests that the leasing of fibers isa better deployment policy for the government as compared to the other alternatives. Finally, we show that the architectural details of the network play a key role in deciding the economics. In particular, one variant of the PON is shown to be more viable than another. Abstract: In this paper, the performance of a multihop decode-and-forward (DF) based freespace optical (FSO) network is investigated over a unified exponentiated Weibull distributed atmospheric turbulence channel with pointing error and both types of detection techniques, i.e., heterodyne detection and intensity modulation/direct detection (IM/DD). We consider the aperture averaging receivers at both the intermediate relays and the destination to diminish the disadvantageous impact of atmospheric turbulence. First, we derive the new unified expression of the probability density function of the instantaneous signal-to-noise ratio (SNR). Based on the derived statistics, the unified closed-form expression of the average symbol error rate (SER) for the considered multihop network employing differentially modulated M-ary phase shift keying data, is obtained by utilizing a transition probability matrix. It is shown that increasing the hop count by 1 provides similar performance gain under both detection schemes. Further, a small increase in aperture size results in greater improvement under moderate turbulence rather than strong turbulence. The mutual information of the considered network is obtained with binary differential data, and it is demonstrated through results that, in the low-SNR region, the heterodyne receiver provides less mutual information as compared with the IM/DD receiver. However, beyond a particular SNR value (which depends on the hop count, aperture size, and turbulence strength), the heterodyne receiver attains more mutual information in comparison with the IM/DD receiver. The unified expression of outage probability for the DF-based multihop FSO network is also derived in terms of Meijer's G function. In addition, the asymptotic SER performance is examined in order to get impactful insight of network performance at high SNRs. All analytical results derived are verified through simulations. Abstract: The IEEE 802.3ca task force is studying the next generation Ethernet passive optical network (NG-EPON), which introduces channel bonding to enable optical network units (ONUs) to bundle multiple wavelength channels to achieve higher peak rates. In order to register these multi-channel ONUs, the optical line terminal (OLT) needs to acquire ONUs' device information, assign working parameters, and verify the connectivity of each channel. Traditional ONU registration protocol, designed for singlechannel ONUs, is not suitable for multi-channel ONUs because it cannot guarantee the channel connectivities of all channels. Therefore, it is essential to extend the traditional registration protocol or design a new registration protocol for NG-EPON multi-channel ONUs. In this paper, we first extend the traditional registration protocol directly to satisfy the requirements of registering multi-channel ONUs. Besides, we propose a novel registration protocol based on the coordination of channel terminals. In order to compare the performances of two registration protocols, we model their registration processes, analyze their registration delays, and find their corresponding influence factors. Simulation results show that our proposed registration protocol has a smaller registration delay as well as better horizontal scalability. Abstract: The European National Research and Education Networks have a long tradition of shared use of resources, in particular, by deploying alien wavelengths (AWs) that disaggregate the transponders from the optical transport network. This network evolution is being extended by making use of White Boxes and fully disaggregated transport networks. In this paper, management architecture and White Box interoperability scenarios are discussed, and it is shown that a software defined networking based solution can be used to manage selected optical White Boxes. Novel transport network simulation tools are compared with existing tools and validated against physical links to highlight the potential and applicability of such tools for analysis and estimation of performance evolution trends for AW deployments. Results show good correlation between new and existing tools, although initially developed for different purposes. Abstract: Direct communication between optical network units (ONUs) is an important function in metro-access optical networks. In this paper, a grid architecture supporting the intracommunication and intercommunication between ONUs is proposed. By employing an arrayed waveguide grating (AWG) and coarse wavelength division multiplexer in a remote node, not only can the intracommunication between ONUs within one WDM passive optical network (PON) be realized, but the intercommunication between ONUs belonging to different WDM-PONs can also be supported. By allocating one specific wavelength to the ONU to transmit direct communication signals and utilizing the periodic assignment property of the AWG, discretionary peer-to-peer direct communication between ONUs can be achieved. By adopting a grid topology and expanding module, the network can not only realize multiple-fault protection but also carry out online expansion. Both the scalability and the reliability of the network can be improved. Finally, the performance analyses and the simulations verify the feasibility of the proposed architecture. Abstract: In optical transport networks the quality of transmission (QoT) is estimated before provisioning new connections or upgrading existing ones. Traditionally, a physical layer model (PLM) is used for QoT estimation coupled with high margins to account for the model inaccuracy and the uncertainty in the evolving physical layer conditions. Reducing the margins increases network efficiency but requires accurate QoT estimation. We present two machine learning (ML) approaches to formulate such an accurate QoT estimator. We gather physical layer feedback, by monitoring the QoT of existing connections, to understand the actual physical conditions of the network. These data are used to train either the input parameters of a PLM or a machine learning model (ML-M). The proposed ML methods account for variations and uncertainties in equipment parameters, such as fiber attenuation, dispersion, and nonlinear coefficients, or amplifier noise figure per span, which are typical in deployed networks. We evaluated the accuracy of the proposed methods under various uncertainty scenarios and compared them to QoT estimators proposed in the literature. The results indicate that our estimators yield excellent accuracy with a relatively small amount of data, outperforming other prior estimators.